Motivated by the recent experience of cleaning out my grandparents' house, I am committing to a lifestyle of less personal accumulation. (How many broken toasters must be saved?) If you decide to follow along, we'll clean house together, one category at a time, finding new homes for the things we no longer need while keeping as much as we can out of the landfill. Are you ready to take The Downsize Challenge? With the exception of my trip to Nancy's, (where I won't have to pay until tomorrow), I anticipate a lot of action today for the plastic cards in my wallet. Not just the ones that are used for actual transactions of funds, but the others that promise rewards, savings, points, free cups of coffee, and other mysterious benefits of membership. Platinum and Gold credit cards could serve as our royalty, unless of course, they've been maxed out, or are expired. We'd have to establish rules and agree on face values in order to play games like 'war' with Borders, Barnes&Noble, and Booksamillion. Do you think a Starbucks coffee card should have more face value than a Dunkin' Donuts card, or would it all depend on how much is left on the balance? This week's downsize micro-challenge should only take you a few minutes. Sit down with your wallet, dump out the contents, and decide what should and shouldn't be in there. You're sure to have enough legitimate stuff to carry without keeping things that are expired, useless, or more securely stored someplace else. And if you are carrying cards for someone else too, (AARP supplemental insurance, and three different Florida ATM cards that belong to your grandfather, for example) Consider keeping these separate from your own stuff, to at least make for more focused scrounging around the wallet when you need to find them quickly. And once you know what is in there, it would be a really good idea to make a list to keep at home, at least of the credit cards and bank cards that you carry, so that if you mindlessly leave your wallet in a coffee shop by accident, or you happen to be in Madrid and get mugged, you'll know what you are missing and you'll be in a better position to take action. Though I am only a skein or two away from 5 dollars off my next purchase, the punch card for the Yarn Shop in Vermont can probably get recycled now, since it's a four hour drive from my current home, and I've completely given up knitting. Store discount cards for places I don't frequent will go in the shredder this afternoon. I notice that the signature on my original social security card dates back to fourth grade, when I was first learning cursive writing. My signature was so much more legible then. I really shouldn't be carrying that around in my wallet at all. It should be in a fireproof safe someplace. Consider this scenario. The phone rings impatiently. You run from one end of the house to the other to grab it. Out of breath, you answer, it turns out to be your mechanic, with estimates for the various options for fixing your car so that it will pass inspection. You need to write down some information. 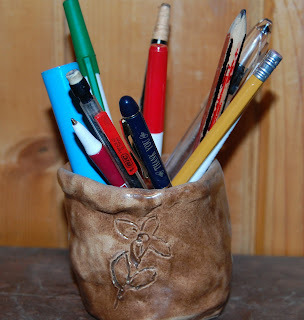 You reach for a pen from that mug on the counter, (the one that your kid made in third grade art class, that you will feel obligated to keep for the rest of your life). You start to scrawl, but the ink won't flow. You circle wildly, scratching holes in the one piece of scrap paper you were able to find, while saying, “Hang on a second, my pen is dead...” The next thing you grab is a pencil with bite marks, a broken tip, and a hardened eraser. After several more false starts, you finally find a crayola marker that works, (fortunately, it's washable, since the paper is now shredded and you are writing labor estimates on your arm). A. Mindlessly shove the dead pen and dull pencil back in the mug, where their uselessness continues to frustrate you intermittently for the next twenty-seven years? B. Idealistically convince yourself that you are going to sharpen the pencils and get refill ink cartridges for every dead pen “someday”, but never actually do it? C. Deliberately throw them into the trash can, sending them on their journey to the landfill, where they will inform future civilizations about the advertising strategies of our pharmaceutical, banking, and insurance industries? I tend toward A and B, but not C, which seems to run in the family. Last spring, during the process of cleaning out the Florida condo, I came across several hundred pens in Opa's desk. Since he was eager to help, and I was eager for him to sit still so that I could keep cleaning out the closets while he wasn't looking, I set up a work station at the kitchen table. He spent an entire afternoon testing pens and sorting them into categories; Dead or Alive, (a concept we could relate to very easily). Since we were moving, we didn't need any of them, so the “alive” pens were donated to a nearby preschool with a low budget for office supplies. The “dead” ones presented the issue of disposal that dead things always do. How many of the writing implements in your home are missing the point of their existence, and more importantly, what are you willing to do about it? Investing just a few minutes in this week's challenge is certain to increase your efficiency. First, let's start with pencils. If it's mechanical, and you are out of lead, either get more today or say goodbye. If your collection includes the good old fashioned yellow ones, this is equally straight forward. If it's dull, sharpen it. You'll feel very satisfied and the process is certain to stir up memories of early elementary school. The issue of the eraser requires a value judgment. Will you still use the otherwise perfectly good pencil if the eraser is petrified? If yes, skip to the next paragraph. If no, consider replacement, or reactivation. Pink erasers that fit over the end of your pencil cost about ten cents each. Hardened erasers can often be revived by running them over an emery board or sandpaper. Things with ink can be misleading. Your pen may not really be dead, just unresponsive at this moment, and you may be able to resuscitate it if you know what to do. We all know the vigorous circle scribbling step. “Pen, Pen, are you okay??! !” I came across one blogger who said that scribbling the tip of a dead pen over a circle previously scribbled by the ink from a live pen can restart the flow. I haven't tried it yet, but hey, if jumper cables work for cars...? Reviving will only work if there is still ink in the pen, which seems obvious, but must be mentioned. If your attempts fail, you'll need to accept that the pen is indeed dead. Now what? A little online research led me to suggested uses for parts of pens, but the idea of sawing pen barrels into beads for kid craft projects appealed to me even less than wearing a necklace made out of macaroni. So I am delighted to introduce to you, The Pen Guy. His name is Costas Schuler and he is on a mission to collect a million used pens. When he isn't working his day job as a graphic designer, he promotes pen recycling by collecting pens and gluing them onto his 1981 300SD, 'Mercedes Pens'. You can send any kind of used pen to him at The Pen Guy, P.O. Box 994, Forestville, CA 95436. I have a box labeled and ready to ship later this week. As of Monday, he posted that he has collected over twenty-two thousand used pens over the last five years. His website,http://www.thepenguy.org/, describes his visions for creating Pentopia. Check it out to see very cool pictures of his car. I have been a fountain pen user for decades, and this cuts down considerably on my pen consumption, but nibs aren't very practical for things like Yahtzee score sheets, or grocery lists, so I have accumulated my share of ball points. I am making a concerted effort to remind myself that something free is not necessarily something I need, and this has prevented me from bringing home more pens for the mug. As a committed downsizer, I am not generally one to promote introducing any new items into the house, except when quality can replace quantity. After reading an advertisement this week for 'The Seven Year Pen', I am intrigued. It's made in Switzerland, contains more than three miles of ink, is guaranteed to write for seven years with daily usage, is available in a multitude of snazzy colors, and costs less than 8 bucks. Has anybody tried one? If you find that you have accumulated more functional pens than you can possibly use at home, redistribution is always an option. Consider taking them to public places where people are often scrounging for pens, (banks, waiting rooms, etc.) and quietly leave them there. Return them to your workplace, as long as you've got one outside of the house. Finally, if all else fails, and the people at your next Yankee swap are likely to have a good sense of humor, consider bringing a complete pen and mug gift set. Just make sure the mug doesn't have your name on it. As a person more inclined toward Little House on the Prairie than The Jetsons, I've generally been a resister of all things technological, and didn't purchase my first cell phone until most people were on their third or fourth upgrade. That was back in the days when androids were characters in Star Wars, blackberries were picked by grandmothers who wore aprons and still knew how to make jam, I Touch was definitely not something you would ever admit, and a 'hot spot' required treatment by a veterinarian. I remember my first cell phone with nostalgic longing. It was a simple model that could be used for making and taking calls. That's it. And yet, it still seemed so magical. I remember the first time it rang when I was in a public restroom and I had to decide if I should take the call, or wait. Wow. Now that is accessibility. It changed life forever, even without any fancy applications. The manual was less than one hundred pages, and most of those were instructions about using the voice mail system, which was the most complicated function the phone could perform, and took about six minutes to master. The phone worked wonderfully, until it started having problems holding a charge, as all phones seem to do when they are approaching the end of their 18 month lifespan, coinciding, as usual, with the end of the contract agreement. Since a new battery would cost more than a new phone, I fell for the “free” upgrade scheme. I ended up with a basic flip phone that could do a lot of things that I didn't feel a phone really needed to do. As predicted, I never used the camera on purpose, but did take a series of unintentional shots of the inside of my coat pocket. So the upgrade ultimately replaced the deactivated, and the junk drawer in my kitchen developed a new subcategory. As of yesterday morning, there were four dead cell phones in there, along with four house chargers, three car chargers, and a few clips and ear pieces and other accessories that serve no purpose. When I asked my friends at the local town transfer station about recycling cell phones, they told me to throw them in with the regular trash. This made me wince. Common sense, along with the Environmental Protection Agency, will tell you that there are many good reasons not to put old cell phones into landfills. Toxic waste is the main one. Fortunately, cell phones can be refurbished, reused, and recycled, and your donation of an old cell phone can even generate funds to support a charity of your choice. It's easy. First, go find your old phones in your closets, drawers, and cabinets, then decide who you would like to support with your donation. One of the more publicized programs is Cell Phones for Soldiers, a company started in 2004 by teenage siblings, Brittany and Robbie Berquist. Cell Phones for Soldiers collects donated cell phones, sells them to a recycling company, and uses the proceeds to purchase prepaid calling cards for American troops who are faraway from home. If you are interested in donating your phone to this organization, visit the website link below, enter your zip code to find a drop-off location, (there were three within 8 miles of our rural home), or print a prepaid mailing label and drop them in the mail. There are hundreds of other programs that collect donated phones for different causes. Since I had four to get rid of today, I chose to support several different organizations, including HopeLine, Verizon's program to collect, recycle, and refurbish cell phones and provide service to domestic violence victims. As with most cell phone recycling programs, you can print a free shipping label from their website. What about other charities that accept donations? Once you start looking around, you will notice that there are collection boxes at many retail locations that you probably visit regularly. Home Depot, Staples, and Lowe's are just a few. They each support different causes. Schools and other organizations often collect phones for fund raising events. What about the personal data on the phone? Your phone retailer can remove data from your old phone. What happens when your donated phone is recycled? Firstly, you avoid putting more toxic waste into the landfill. Charities sell them to recycling companies, who either send your phones to a smelter, where they are ground up and the metals are reclaimed (there's a lot of gold and silver in there! ), while hazardous constituents are disposed of conscientiously, or, they are de-manufactured first, which recovers more plastics and usable components before the reclamation process begins. This week's challenge: Release your deactivated cell phones from junk drawer purgatory, donate them to the cause of your choice, and keep old cell phones out of the landfill by spreading the word about recycling. I plan to print out this flyer from the EPA and give it to the guys at my transfer station. These guys are really friendly and they are in the perfect position to divert many cell phones from improper disposition. The Downsize Challenge took a backseat to some personal life up-sizing last summer, but I am back, and am recommitting to another year of cleaning house. The experience of emptying the Florida home of my 95 year old Dutch grandparents last winter sparked a purge surge, inspired in part by their long term over-utilization of a utility closet, which was packed with cut-off toaster cords, half-filled butane canisters, puzzles with missing pieces, instruction manuals for household appliances that were no longer operable, lids to broken coffee pots, stacks of mailing labels with old addresses, forty years of tax records, and a whole lot more. I am determined not to follow in their footsteps in terms of accumulation and I invite you to join me in 2011 as I continue reducing, redistributing, and re-purposing things around our place. If you choose to tag along, I'll email you with the focus for our weekly challenge, including suggestions for finding new homes for the things we no longer use, need, or love enough to keep. Are you ready to kick off the new year??? How many athletic shoes are in current use in your household? When you got your last new pair, what did you do with the old ones? I saved mine for mowing the lawn. That meant that the ones I was already using for lawn mowing replaced the ones I had been saving in the utility closet for the infrequent, but inevitable painting project. The previous painting project pair was then demoted and shoved into the box of miscellaneous stuff in the corner of the closet that is full of other items that I am never quite sure how to deal with, because they seem too useful to be trash, but aren't so useful that they will actually ever get used again by me. They are old smelly sneakers, not worthy of donating for reuse by anyone else, but when I think of them going to a landfill, I shove them back in the closet. Take a very close look at the rest of your shoes. Don't forget about the boots. When was the last time you wore that pair? Are that many black shoes necessary? Are there any you are ready to consign, donate, or discard? -Consignment, if you want to invest the time in the possibility of making a few dollars. -Donation to Goodwill or your local thrift store for resale. If you are finding yourself ambivalent about parting with a particular pair of footwear because you haven't been wearing them but think that you might...try putting a penny in the toe. In 6 months, when I remind you to check for change in your shoes, you can make a more informed decision. While we are thinking about our feet, let's check out the sock situation. Any in donatable condition that you just don't use because they are hot pink and you are just not a hot pink person? How many of your socks have holes in the toes or heels? How long are you planning on saving that stray? -stretch one over your broom and see what it picks up, amazing! Not only a source of support to legs, nylon stockings can be used to store wrapping paper, rolled posters, or anything that tends to unwind and could benefit from a little compression. So the challenge this week is to streamline your shoes, socks, and hose. Start the year with one step in the right direction. Do you like the Downsize Challenge? Some of your Facebook friends might. © Copyright 2011 Julie Lanoie. Awesome Inc. theme. Powered by Blogger.